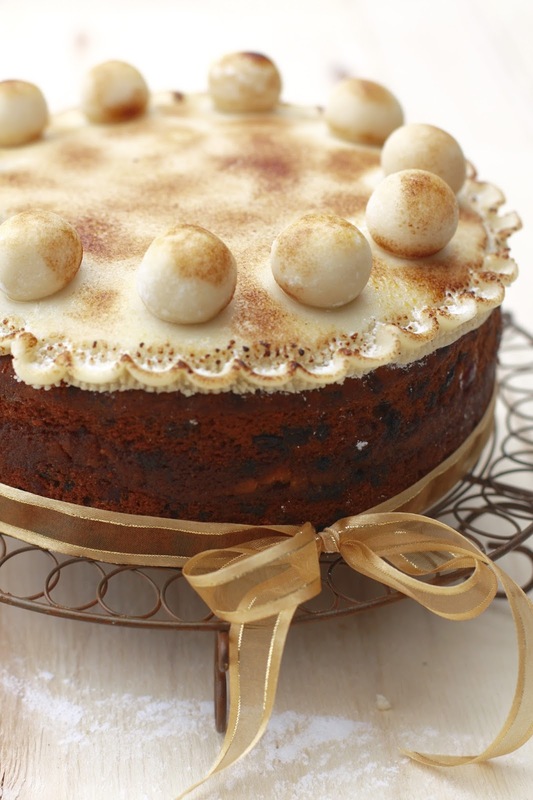 The Simnel cake is a light fruit cake with marzipan baked in the middle of the cake and used as decoration on top. It often has 11 round balls on top referring to the 11 true Apostles. 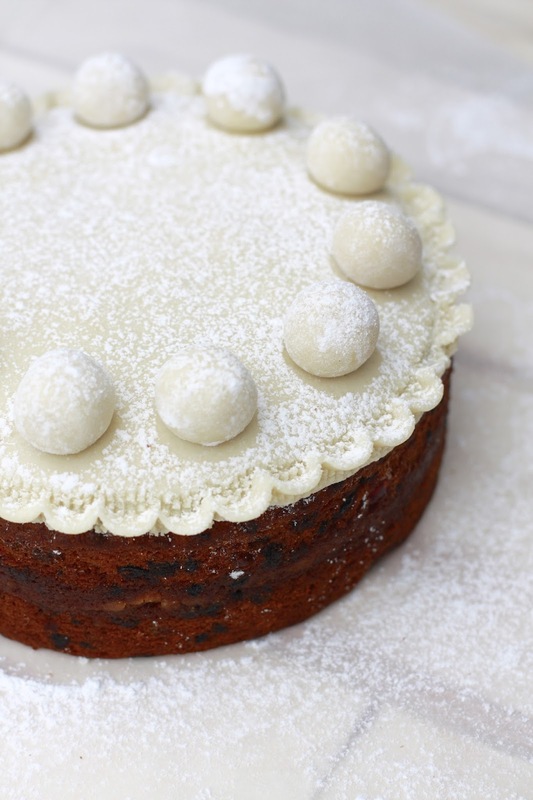 The essence of this light fruit festive cake is the quality of the marzipan. Use divine home made marzipan proudly. Make this a day or so in advance, wrap and store refrigerated until required. For the Simnel cake I prefer a simple recipe using some egg yolks to bind the marzipan for colour and keeping it all together seeing as the marzipan is baked into the cake. Proper marzipan could make this cake very expensive too as a lot of almonds are required. I hate saying this but shop bought Persipan can also be used if you have to. Make sure the almonds are really finely ground. The finer the smoother the marzipan. In a food processor pulse the ground almonds, castor sugar and icing sugar together. Add the yolks to bind and flavour with almond essence to taste. Add more icing sugar if necessary to get the marzipan to rolling consistency. This is where I start playing…adding a bit more icing sugar sometimes to have a smoother paste, sometimes adding some glucose too and so on and so on. Use no less than 300g to shape the first disc to be baked into the Simnel cake. The rest will be used for the top disc and 11 balls. 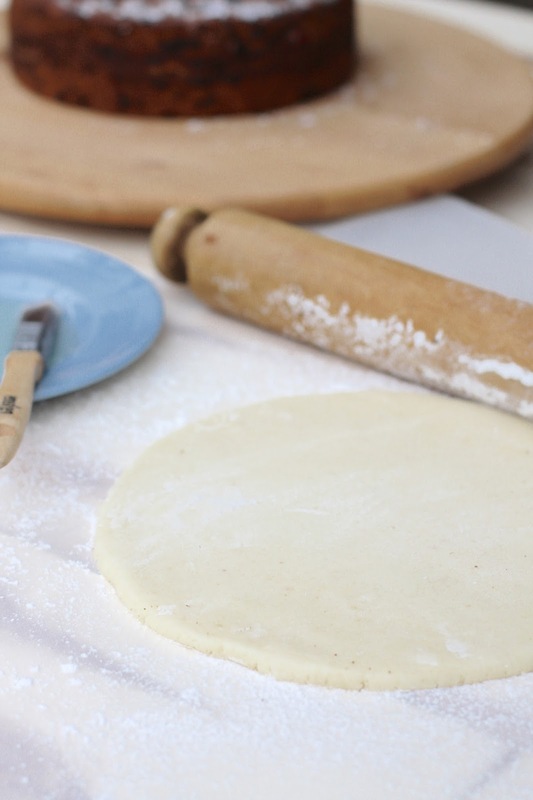 When rolling the marzipan, use icing sugar to dust the work surface. Prepare a 20cm cake tin by lining the bottom with baking paper. You can also line the sides but I find this unnecessary. The cake will bake longer than normal. Best to protect the sides of the cake tin with a wrap of corrugated card board. I also have a foil lid on stand by just in case. This I use during the latter part of baking if I think the top of the cake is browning a little too much. I must admit, usually for the latter hour of baking as my cake often bakes for 2hrs. Measure and sift all the dry ingredients 4 times. Make sure the butter is nice and soft. Soften it more if you have to in the microwave for a few seconds. Using an electric mixer, cream the butter and sugar until light and fluffy using your creaming paddle attachment or as I prefer, the whisk attachment. By the 3rd egg addition your mixture will start splitting. Add the almond flour and continue beating. Then add the last egg. Continue whisking for anther minute or two. Add the lemon zest and juice and don’t worry too much about the mixture splitting at this point. Fold the sifted dry ingredients into the butter and egg mixture. Don’t over mix. An excellent tip is to keep about 25g of the flour mix aside to sprinkle over the fruit. Mix this into the fruit mix very lightly before folding the fruit into the cake batter. Have your 1cm thick cut disc of marzipan ready. Spoon half of the cake mixture into the prepared tin. Place the marzipan disc on top and smooth out any air bubbles lightly. Spoon the rest of the cake mixture on top. Bake on the thermofan setting on your Lofra oven. Pre-heat the oven to 160*C. Baking time is rather long at 1hr 30minutes. Assess if the cake is baked through. Don’t be misled by molten marzipan. In this case a skewer inserted in the centre of the cake will not reveal the whole truth and nothing but the truth. You will have to trust your instincts here. If in doubt, return the cake to the oven, cover the top if needed with the foil lid and bake for another 15 minutes. Repeat if necessary. Allow the cake to cool in the tin before removing it to cool completely on a wire rack. I like to give the cake some cooling down therapy with an extra 50ml of good brandy to soften the outside crust a little. Wrap in cling foil overnight. Perhaps a useful thought: this is a light fruit cake and does not require maturing time but what harm can time do to a fruit cake? I think some curing time with regular splashes of good brandy could but only improve this cake. 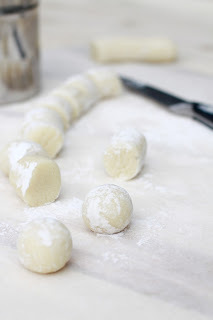 Roll 11 marzipan balls. Best way to ensure that they are all more or less the same size is to roll about 125g of marzipan into a thickish sausage. Cut into 11 portions and roll. Roll all the remaining marzipan on a well dusted surface into a round disc of 20cm in diameter and 1cm thick more or less. Wet the top of the cake with either simple syrup or warmed smooth apricot jam – just enough for the marzipan disc to stick. Cover the top with the marzipan disc. Smooth the top and ease the edges in to get a perfect fit. I went one step further and crimped the outside edges to finish the cake off all vintage like. Decorate the top of the cake with the 11 marzipan balls. Dust well with icing. Brûlée the top and decorate with festive ribbons and other Easter or bunny like paraphernalia if you have.